A shift in institutional food buying has the potential for major impacts on not only the local economy, but on food access, according to Amanda Oborne, Vice President of Food and Farms at Ecotrust, an Oregon-based nonprofit that works to advance farm-to-institution initiatives in the Pacific Northwest. “We put the focus on the buyers with multi-million dollar food procurement budgets because even if they just redirect a couple of percentage points of their budget into the region, that’s going to drive change all the way through the [local] supply chain,” says Oborne. In one example, chefs at Willamette University in Salem, Oregon can order whole hogs from local producers thanks to an innovative partnerships with a meat distribution company. For Ecotrust, and other farm-to-institution groups across the nation, the goals are two-fold. First, they aim to sway large institutions with huge food budgets to leverage their purchasing power in support of small and mid-sized regional farmers, ranchers, and fisherman as a way to boost the local economies. And to pivot away from consolidated global distributors like Sysco. A second, and just as important goal, is to open up access to healthy, local, and sustainable food for the populations generally served by public institutions. For the past five years, FINE has worked to connect local food distributors with institutions in the Northeast. Across the six New England states, institutions spend a total of more than $78 million per year on local food and an estimated 3.8 million people eat at institutions served by FINE. The organization has released the first in a series of reports focused on regional food distributors and food hubs—both the opportunities and barriers faced by small and large companies. According to those New England-based distributors FINE surveyed, together they moved over a billion dollars of food in 2012, of which $366 billion was sold to institutions. Nearly 90 percent believed sales of local food to institutions will continue to increase. The farm-to-institution market holds more power to benefit farmers and fisherman than any other local food market, says Richmond. “When institutions make it a priority to buy local, they can spur unprecedented innovation and investment across the supply chain—and make a significant economic impact,” she says. Not all local farms are equipped to sell to institutions. At 30 acres, Stoneboat Farm in Hillsboro, Oregon qualifies as a small farm. Jesse Nichols, who farms the land with his brother, says his business has benefited from partnerships with institutions. Currently, they supply about $5,000 a month in produce to the chefs at Intel Corporation, just five minutes down the road from the farm. Corporate cafeterias on the campus serve thousands of employees each day. In the future, Stoneboat Farm would like to move into more institutional partnerships. So far, nascent attempts to connect with school food service programs haven’t resulted in much. That’s where mid-sized farms enter the picture. According to a new report published by the Union of Concerned Scientists, local purchasing has a huge impact. The study, which centered on Iowa, found that if 25 percent of the 22,000 institutions and “intermediate markets” in the state procured local food, over $800 million annually would be generated for the state’s economy. If at least half of these local purchases came from midsized farms, they would support over 4,259 farms and potentially 12,320 jobs. To that end, Ecotrust is in the process of creating an infrastructure hub in Oregon, where midsized farmers can find support for many aspects of their business, from marketing to business planning. Logistics—mainly to make it smooth for food service directors at institutions to access to local foods—are another challenge. Why all the untapped potential? According to the report’s authors, the concentration of the food service management market has played a significant role. The largest management companies—Compass Group, Aramark, and Sodexo—operate food services in about 45 percent of all North American institutional food service outlets to the tune of $33 billion in revenue. Food distribution is equally consolidated Sysco and US Foods Inc., the two largest “broadline” food distributors, bring in about $65 billion in combined annual revenue, and dominate 75 percent of the national market. In 2015, the Federal Trade Commission filed an administrative complaint complaining that proposed merger between Sysco and US Foods, Inc. would violate anti-trust laws. At the same time, the movement to reform institutional food procurement has seen measurable success in both the public and private realms. For example, Bon Appétit Management Co., one of Compass Group’s subsidiaries (and the company that runs the cafe at Willamette University), requires its chefs to buy at least 20 percent of its meat, vegetables, and other products within a 150-mile radius. On a related note, Pie Ranch, an organic educational farm in California has begin partnering with private clients including Stanford University and Google to provide local produce for their employee meals. At Google alone that translates to daily meals for around 20,000 employees. In the first installment of this series, we wrote about the Good Food Purchasing Policy in Los Angeles, where the largest public school district in California became the model for how to implement healthy, sustainable, and value-based procurement and serve over 650,000 meals a day. And the Center for Good Food Purchasing, led by Alexa Delwiche, wants to take the proven rigorous institutional food purchasing policy national. But that’s not where it ends. A number of other schools and other public institutions are working to move the local produce dial. The National Farm to School Network and Healthcare Without Harm have been chipping away at changing institutional food procurement for years. And, last April, Nessa Richmond of FINE convened more a dozen farm-to-institution practitioners and advocates from across the country in Washington, D.C. to launch the first national working group around the issue. “With food system work, we’re swimming upstream on so many things, but I think this effort has the potential to make a giant measurable difference in the relatively near term,” says Ecotrust’s Oborne. Photos by Shawn Linehan. 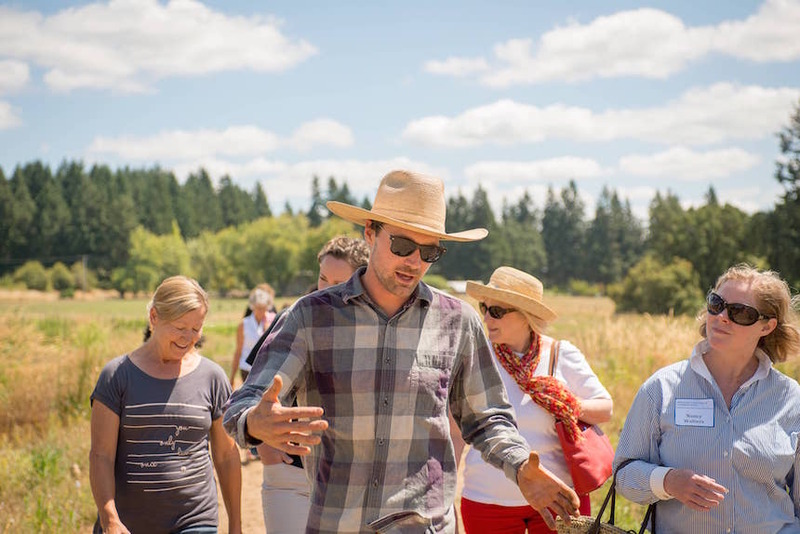 From top: Jesse Nichols of Stoneboat Farm gives the food services directors from Willamette University a tour; Nichols with Andre Uribe, executive chef at Bon Appétit Management Co.’s Willamette University cafe.